In 1939 the world and Australia with it, had been plunged into the dark depths of a second World War, when Germany invaded Poland. Europe was far away from Australia but in December 1941 the world of conflict reared it’s head in our sphere of the globe when Japan attacked the American Base of Pearl Harbour and British bases. 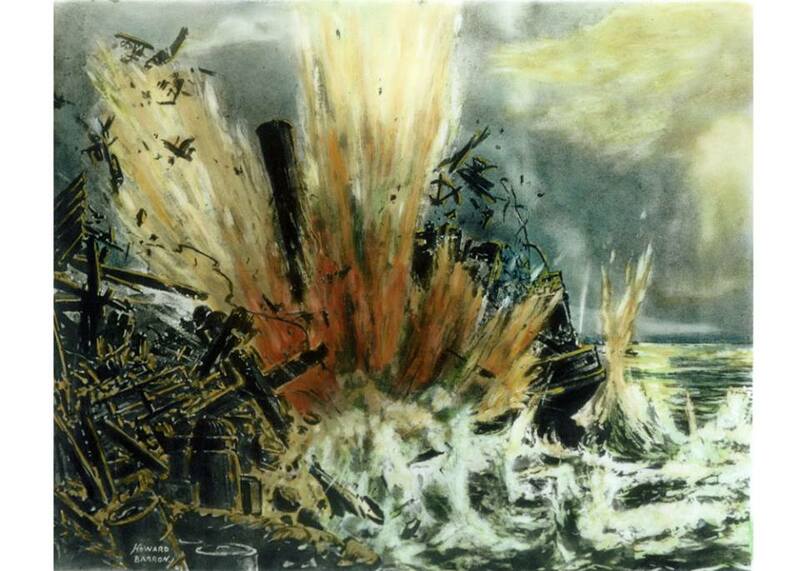 It came closer when Japan bombed Darwin and Broome February 1942. Closer still when Japanese submarines attacked shipping in Sydney Harbour and the Eastern suburbs were shelled. What would be next? Invasion was expected. All of the country was on alert and the dear old town of Windsor was no exception and prepared for war. It was the night of the 31st of May. Windsor had settled down quietly under it’s wartime blackout. The ink-black Hawkesbury River flowed silently under the Bridge just down from No 6 Bridge Street as the Armstrong family - Roma, Jessie and Leo – went about their nightly routine. All the blackout blinds were in place and the house was secure and snug. Then! The green emergency light above the phone began to flash! Somewhere there was an emergency and Leo, Captain of the Windsor Fire Brigade, would be needed. He picked up the phone and listened intently. His face took on a seriousness reserved only for the worst contingency. On putting down the phone and between climbing into his uniform and reaching for his helmet he told Rome and Jessie what he now knew. The Japanese had bombed Sydney Harbour! They had used submarines and now all towns and cities were alerted to possible attack from the air. All necessary personnel were to report to their stations for duty. Leo left for the Fire Station, leaving Roma and Jessie to huddle in the darkness in fear of what might happen in the ensuing hours. Their ears strained listening for the droning sound of aircraft overhead, the whistle of falling bombs followed by explosions. The Air Base was just nearby...a probable target. And then there was Windsor Bridge...another target. The wardens were called out too. The National Emergency Service had been planning, organising and training and by January 1942 they were ready to go into immediate action on the sound of the first alarm. All warden’s posts were manned 24 hours daily. The township had been divided into sections and Roma and Jessie were under the protection of Senior Warden J.W. Mitchell and wardens Mynett, Armstrong, Tebbutt, Asprey and O’Brien who were to patrol Sector 1, the area bounded by Bridge Street, river and South Creek. Nearby in Sector 2, the area bounded by Bridge, George, Fitzgerald and the River was Senior Warden Pollock and warden Hamilton. Thompson Square was secure. The general public had been educated as to what procedures were to be followed in the case of an attack. On the 6th May, the N.E.S. had run a free instructional film night which provided much needed information on the activities of the N.E.S., first aid. the work of rescue parties etc. Another group of volunteers, The Volunteer Air Observers Corps, consisting mainly of retired farmers, spent many hours manning outlying posts keeping watch for enemy aircraft. At some time one of the captured Japanese subs went on display and , as Roma tells it, she and her sister very cheekily scratched their names into it! Windsor soldiered on during the war years and for the Armstrong family these years saw two weddings. In 1942, Joyce Armstrong married William Douglas and in 1945, Allen Armstrong married Kathleen Leet. The little cottage hosted the reception for Allen and Kathleen and it must have been pretty day for Thompson Square. In the 1950’s Leo , who had always liked verandas, decided to build a new cottage for Roma and Jessie. No 6 had always had an allotment of land beside it, so he designed and built the first cottage one now comes to as they cross the Bridge from the Wilberforce side of the River into Windsor. And it is surrounded by Leo’s much loved verandas from where he and his family could view the expanse of the river and beyond. For some time Leo had also owned the present day building of River Music, from which the Armstrong siblings had run a small shop, making a full row of Armstrong acquisitions. Jessie Armstrong died in 1967 and Leo soon after followed her in 1967. They both rest in the shadow of St Matthew’s Anglican Church. Roma was the only remaining Armstrong in the cottage for some time and it is only in the last few years she has had to remove to a nursing home. It is with great sadness that we (CAWB) must report the recent death of Miss Roma Armstrong. She was the inspiration for finding the story of No 6 Bridge Street and she gave willingly of all she knew to help enrich that history. Roma Armstrong was a great and gracious lady. She had so much presence and was so “with it”....she impressed with her strength of mind and her directness. I am very grateful to have had the opportunity to meet with her. When she spoke of the life she had lived, one was aware they were speaking to “history” and “history” was speaking back...informing, explaining, showing and answering the questions that one had formulated. Her stories were so vivid and so real and told with expression and feeling. I only wish I had known more so I could have asked better questions. And she would have answered them. God love her. She will be greatly missed by all who knew her. May these stories of the Square and in particular, of No 6 Bridge Street, stand as memorial to her spirit. In 2013, the last of the Armstrong buildings...Leo’s veranda-surrounded.... cottage was put up for sale.....and thus ended 100 years of continuous occupation of the Square by the Armstrong family. The little cottage of No 6 still looks out over the Square and is now the property of a solicitor. Soon to possibly look into an elevated concrete highway. It is worth reflecting upon this piece of ground. These buildings sit on Andrew Thompson’s property with No 6 atop his store and the newer lower building atop his house. 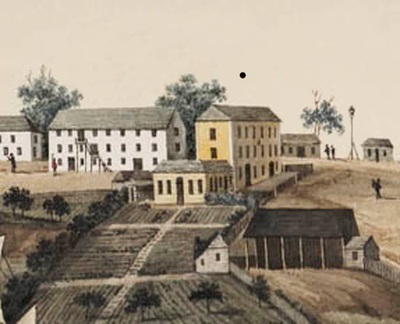 The image done when Windsor was called Green Hills shows these original structures with Thompson’s Warehouse and retail store building at the top of the hill under the black dot. To the right is the Bell Post used by the garrison troops from which the square was originally named. 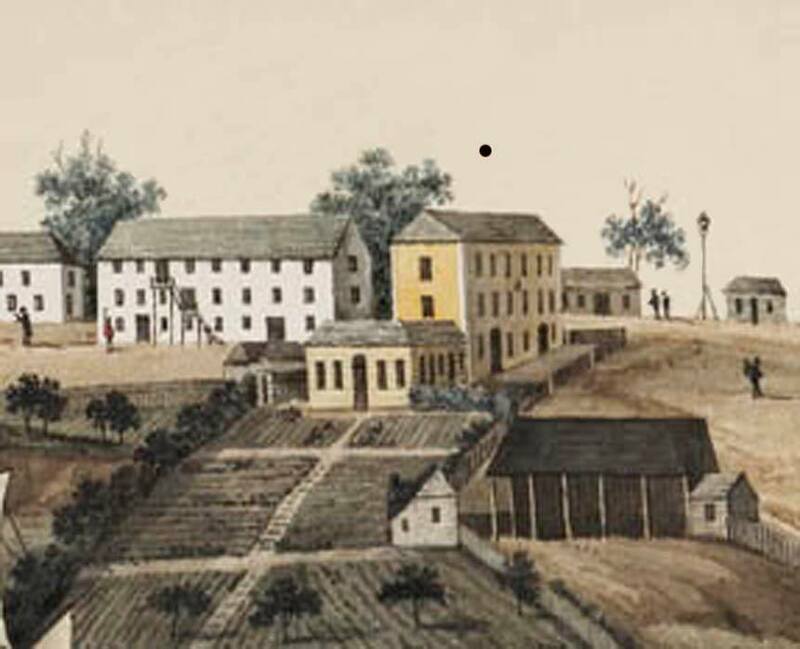 To its left is the Govt Stores building from which the leader of the Vinegar Hill Uprising Andrew Cunningham was hung. The School building lays beyond. Thompson’s gardens can be seen cascading down the hill. Part of the original brick walls from Thompson’s Precinct can be still seen in the yard of Leo’s cottage and need restoration. 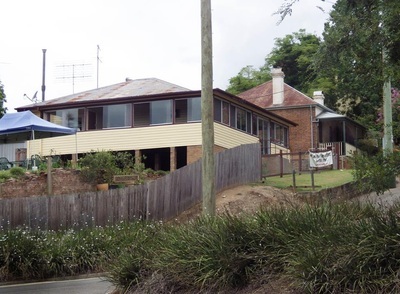 But if the new Bridge eventuates the two cottages will disappear from view, hidden by a pile of concrete and forever imprisoned by a continuous stream of screeching, rumbling, trucks.